Nilfisk and Blue Ocean Robotics are announcing today that the two companies will begin a strategic co-operation to develop intelligent cleaning machines and robots for both the Danish and global markets. 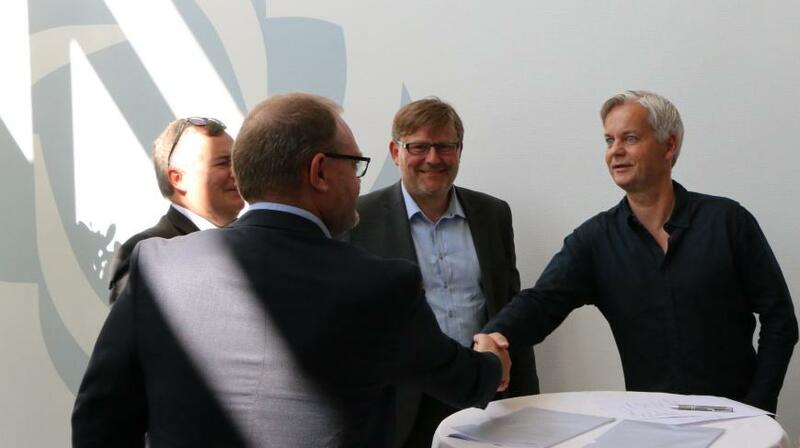 The co-operation will complement Nilfisk’s existing partnerships in the robotics field – an area that is expected to comprise up to 10 percent of the company’s turnover within 5 to 7 years. Denmark –October 3, 2017 - Nilfisk expects that up to 10 percent of the company’s turnover will come from self-driving machines – or robotics – within the next 5-7 years. A new strategic partnership between Nilfisk and the specialized Danish robot company Blue Ocean Robotics will be part of realizing that goal. The co-operation, which supplements Nilfisk’s existing partnerships within robotics, is ambitious and should lead to a robot transformation of selected Nilfisk cleaning machines in the years ahead. Hans Henrik Lund emphasizes that Nilfisk is already well underway with its technological transformation. “We have a clear multi-partner strategy and wish to develop our product portfolio in close collaboration with highly-specialized technology companies that are the best within their fields. We’ve had very good experience with that already, and we look forward to the beginning of our co-operation with Blue Ocean Robotics, which complements our existing partnership with Carnegie Robotics very well,” says Hans Henrik Lund. Blue Ocean Robotics and Nilfisk plan to work together to develop selected Nilfisk products in close co-operation with customers from the industry. The process is a proven approach for the Danish robot company, which has built its business around “disruptive innovation.” This involves a number of integrated technology platforms (TP-X) and a set partnership model (RoBi-X), where Blue Ocean Robotics and Nilfisk together will develop the products. “There is a very good match between the technology and capabilities that Blue Ocean Robotics possesses and the solid market position Nilfisk has. It’s an optimal starting point for creating the cleaning industry robots of the future,” say the three Co-CEOs of Blue Ocean Robotics, Claus Risager, Rune K. Larsen and John Erland Østergaard. Blue Ocean Robotics is a highly specialized company focusing on developing new generations of robots for the global market. Development takes place together with strategic partners who typically have a strong market position. Blue Ocean Robotics takes care of technology development in collaboration with the partners and the partners take care of global sales, service, and production. The development is based on a series of integrated technology platforms (TP-X), which ensures synergy across Blue Ocean Robotics’ various partnerships. The co-operation builds on a unique partnership model. (RoBi-X). See more at www.blue-ocean-robotics.com. Nilfisk is a leading global player within the professional cleaning industry. With more than 110 years of innovation experience, Nilfisk is dedicated to delivering reliable solutions and product of high quality that pave the way for a safer, more productive and clean daily life for millions of companies and private homes around the world. Nilfisk has its own sales companies in 45 countries, and its products are sold in more than 100 countries.